Sierra Nevada | Sierra Nevada | Ecosign Mountain Resort Planners Ltd. 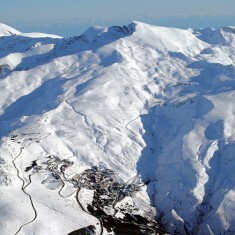 The Sierra Nevada Ski Resort, located adjacent to the Iberian Peninsula’s highest peaks, is Europe’s southernmost ski centre. 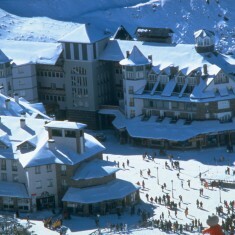 Between 1990 and 1993, Ecosign developed the overall Sierra Nevada Master Plan in preparation for hosting the 1996 World Alpine Skiing Championships. 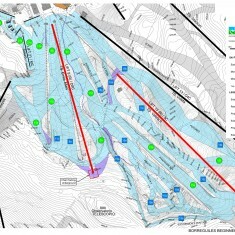 Key improvements to the Sierra Nevada Ski Resort included the design of the World Alpine Skiing Championship venues, improvements to the existing ski area, design of a new village centre and renovation of the existing village area. Ecosign’s plan also included the strategic location of staging lifts and the infilling of commercial beds, allowing the resort to comfortably accommodate over 30,000 skiers per day. Just prior to hosting the 1996 World Championships, a new village with 4,000 beds was constructed on top of a four-level, 3,000 vehicle parking structure as per Ecosign’s design concept. Construction of the CDN $200 million project was completed in December of 1995. 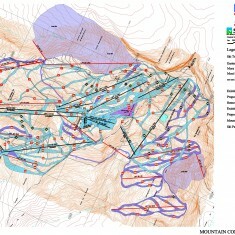 Ecosign worked continuously on a project-by-project basis designing lift terminals, new pistes, a half-pipe and terrain park, and skier staging areas since 2003, and was brought back to update the 1993 Master Plan. Skier visitation at Sierra Nevada has risen to over 1.2 million skiers per year and the new Ecosign designed village at Prado Llano has become basically over-run with customers. On the mountain, every new lift and slope was greeted by more and more skiers. With these growing pains, Miguel Angel Serrano, the new General Director and Eduardo Valenzuela, the Ski Area Manager contacted Ecosign to prepare plans for a new village at the top of the urbanization and to refine the 1993 plan with improved access from the urbanization to the slopes and to add more slopes and lifts for the growing customer base at Sierra Nevada. 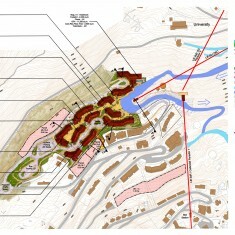 The Sierra Nevada Master Plan completed in 2004 includes a new 2,800 bed pedestrian village with underground parking above the previous village in an area called PS-12 on 5.7 Ha of land. There is also a new day skier parking, staging and beginner area at the University area. The 2004 Master Plan’s intent is to increase the beds at Sierra Nevada from 24,700 to 30,800 beds, double the amount of day visitor parking, and increase the comfortable carrying capacity of the ski area from 16,900 to 27,600 skiers per day. 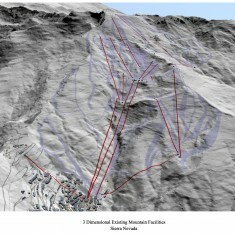 The objective is to allow the Sierra Nevada Resort to grow from 1.2 million to 1.8 million skiers per season.